Droopy, Peter Pan's Mr. Smee, and Humphrey Bear's Ranger Woodlore. Touché Turtle, the Thompson-voiced character in question, was a swashbuckling hero who didn't appear very formidable, and yet who always managed to save any fair damsels who happened to be in the vicinity before his five-minute cartoons came to a close. Touché occupied a segment of The New Hanna-Barbera Cartoon Series, which debuted in syndication on September 3, 1962. Hanna-Barbera was having a good deal of success of shows like Huckleberry Hound and Quick Draw McGraw, each of which featured a star in the lead segment followed by two less prominent series as back-up, but with this one they were trying something different. Touché Turtle had equal billing with the other two segments, Wally Gator and Lippy the Lion & Hardy Har Har. Touché had a sidekick named Dum Dum, who was a big, friendly dog. Dum Dum's voice was supplied by Alan Reed, best known as the voice of Fred Flintstone. The setting of the series appeared to be something in the neighborhood of 17th century France, but in the Hanna-Barbera Universe, that wasn't so far away that he couldn't cross over with other characters when the situation required it. In fact, one of his second season episodes introduced a character who went on to his own minor series, Ricochet Rabbit — a western. 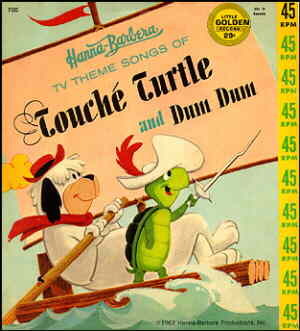 Touché even appeared in a few comic books from Gold Key or Charlton, but never in his own title and seldom on a cover. Touché Turtle was later a member of Yogi's Gang, an early 1970s ensemble production that kept several characters from fading into complete obscurity. Since then, tho, complete obscurity is pretty much what he's faded into.